Rusnak Auto Group wanted a “high-tech,” high-performance identity for its new Arcadia, CA dealership – an identity compatible with the fine Mercedes automobiles available there. To help project the desired image, Alucobond® Material by 3A Composites USA Inc. was chosen for architectural signage as well as exterior cladding of the auto dealership itself. The project utilized 6,160 sq. ft. of 4 mm Alucobond Material in Champagne Metallic color. Panel attachment at both the horizontal and vertical panel joints involved a 1-1/4” deep hat sub-section and contrasting, darker silicone sealant, according to Glenn Schuske of GES Sheet Metal, Pomona, CA. Panels were fabricated by GES, which also assembled column covers in its shop. The architectural firm for the project was FMG Architects of Oakland, CA. The first location for what is today’s Rusnak Automotive Group was opened in 1959. The business has since grown in the greater Los Angeles area to include 16 locations offering 12 different makes of automobiles. Rusnak Automotive Group has received many awards for customer service and satisfaction from rating organizations, publications and auto manufacturers. 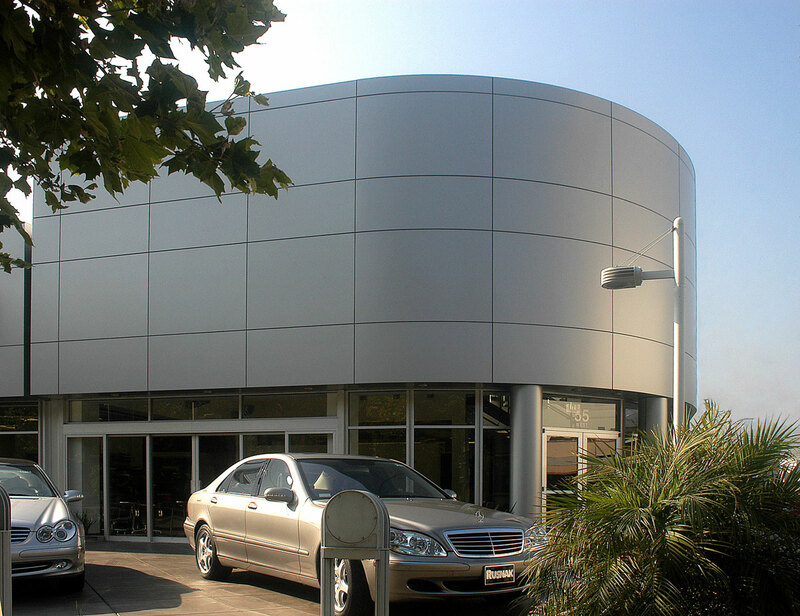 Alucobond Material is frequently chosen for automobile dealerships because of the sleek, high-tech look of the aluminum composite material (ACM) panels. 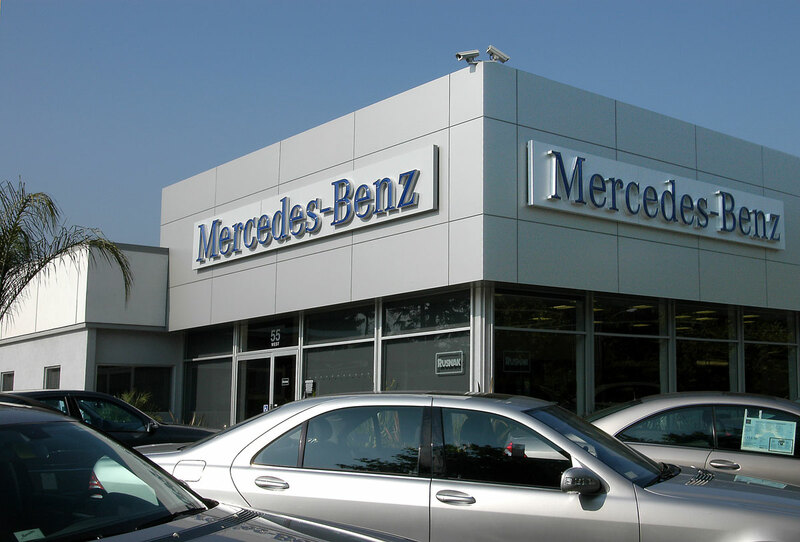 Incorporating the product into both signage and architectural applications can help project the desired corporate identity look throughout the entire dealership, and from one dealership to another. Alucobond Material consists of two sheets of .02” aluminum thermobonded to a plastic core, and is manufactured by the Benton, KY plant of 3A Composites USA Inc.